In “Kittens Can Kill” by Clea Simon, we meet animal trainer/behaviorist Pru Marlow, who after she escapes from the big city back to her hometown, expects life to be more peaceful and quiet. Boy is she wrong. Her gift of being able to mentally communicate with animals makes life even more difficult because the information that she receives from the pets makes her suspicious about the death of someone who died from “natural causes.” She discovers this body when she shows up for an appointment that is meant for the deceased man’s kitten. When she enters the home she finds both the kitten Ernesto and the body of local attorney David Canaday. Being just a young kitten, Ernesto’s communication skills are very limited, yet Pru feels that something is not right. When Pru brings Ernesto to the home that she shares with her cat Wallis, Wallis is not too happy and lets her know it. Pru feels compelled to solve this mystery, and follows the case as she continues her work with animals. Her sort of boyfriend/booty-call man does not help her at all. He is in law enforcement and unwilling to share confidential information. Canaday’s three daughters and his ex-business partner all have very complicated relationships. Some of them blame each other for Canaday’s death. One daughter blames the poor kitten and wants to have him put down. This is definitely not an easy case. The ex-business partner’s dog also has some information to offer Pru; however, she has a hard time understanding what it is the dog is trying to tell her. As Pru continues to try and solve this mystery, she also has to deal with some of the local colorful characters, including an ex-boyfriend and his bar mates. While not everybody wants to help Pru, she seems to do a pretty good job of wrapping the case up and tying up all of the loose ends, just like you would do with a ball of yarn. 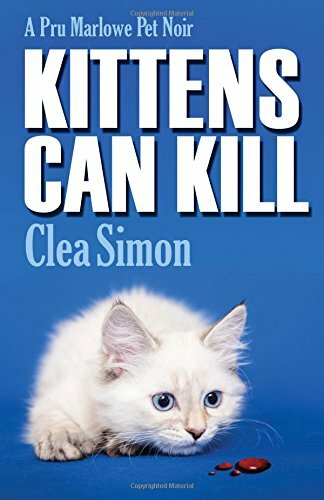 I enjoyed reading “Kittens Can Kill” by Clea Simon. The dynamics of the local town folk, including the people involved in the case, made it more interesting. Being an animal lover and a big fan of rescuers, I loved that the protagonist’s heart was in the right place as far as caring for the animals and being able to connect with them. Her connection with humans is not as great; she is afraid of them discovering her secret connection to animals and thinking that she is crazy. This definitely makes it a unique tale. I haven’t read the other books in this series; however, I felt that this book stands well on its own. I would definitely enjoy reading the others and I hope to do so in the future!